The Las Vegas gunman was a narcissist, a committed gambler, and a man who would become passionately absorbed in hobbies, like flying or scuba diving, and then lose interest and move on to the next. That's the conclusion in a new report from Las Vegas police that provides some of the most detailed information released to date about Stephen Craig Paddock, who died of a self-inflicted gunshot to the head. It does not address motivation. "Regretfully, this report will not be able to address the why," the report said. 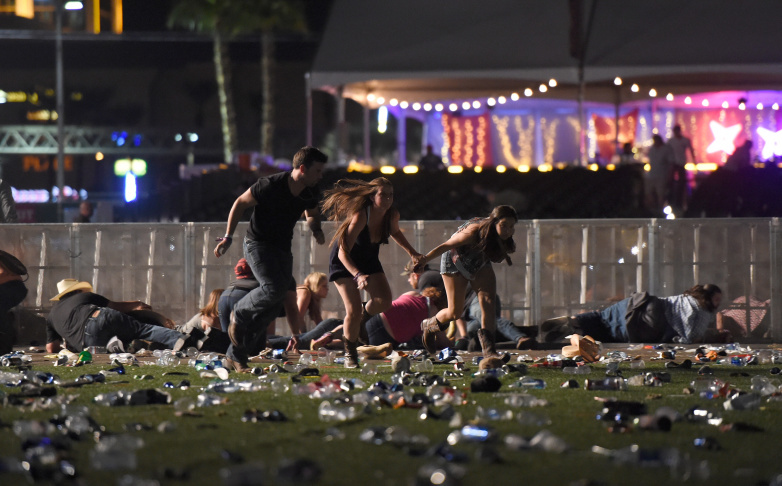 More than half the 58 people killed in the meticulously planned shooting at the Route 91 Harvest music festival in Las Vegas were from Southern California. One worked at Disneyland, another was a special education teacher, another worked at a makeup store. Some of the evidence found on Paddock's computers were searches for open air concert venues, including in Southern California. One search was "how crowded does Santa Monica Beach get." And his Google browser history included map searches of three Santa Monica locations: Venice Ale House, Fairmont Miramar Hotel and The Bungalow on Wilshire Blvd. The 187-page report released Friday by the Las Vegas Metropolitan Police Department said 869 other people were injured including 413 who were hit by bullets or shrapnel. Some 1,057 rounds were fired during 11 minutes of live fire. The report was meant to determine if Paddock acted alone, and to detail his actions in the days before the shooting, including a stay at another nearby high-rise building overlooking the concert venue that could have been a rehearsal run-through for the ultimate shooting spree. He acted alone, left no suicide note or manifesto, the report said. Police found no evidence that he acted out of any radicalization or ideology, in fact, his family and girlfriend described him as an atheist. The report opens with a hotel security guard going to check out an alarm but unable to open the stairwell door to the 32nd floor of the Mandalay Bay hotel. He went up an additional floor and then came down in a guest elevator and found that door was blocked shut. Somebody had screwed an L-shaped bracket into the door frame, preventing it from being opened from the stairwell side. That level of planning, ostensibly to keep police at bay, is part of what enabled Paddock to fire unhindered for 11 minutes on a massive crowd gathered 32 stories below, where some 22,000 people were packed into the Las Vegas Village concert venue. It follows a preliminary report that came out in January that also concluded that Paddock's motive was unknown. Police interviewed hotel employees at all levels from bellman to valet to security manager. They also interviewed several relatives of Paddock as well as his doctor. It also described his relationship with his girlfriend, former casino high limit host Marilou Danely. She described to police how they stayed at the Mandalay Bay hotel in September in rooms similar to the one from which the later attack was mounted. The autopsy report on Paddock said he died of a self-inflicted gunshot to the head. Recently, MGM Resorts sued the victims of the shooting to bring the liability issue out of state court in Nevada to the federal court.